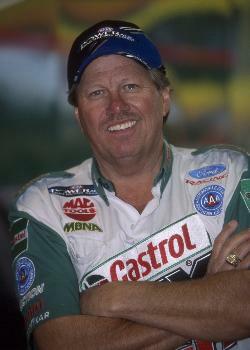 Four-time Jerry Titus Award winner John Force, the NHRA Funny Car Champion for the 13th time in 15 years, is among the 14 drivers named to the 2004 Auto Racing All-America team by the membership of the American Auto Racing Writers and Broadcasters Association (AARWBA). The All-America team will be honored at a Jan. 15 banquet at the Sheraton Suites hotel in Pomona, Calif., where the AARWBA also will introduce the 2004 Titus winner (the driver getting the most votes), the 12 finalists for the Newsmaker of the Half Century award and the winner of the Jim Chapman Award for excellence in motorsports public relations. Force, an All-America selection for the 12th time in his career, was joined on the first team by NASCAR champion Kurt Busch, IRL champion Tony Kanaan, NHRA Top Fuel champion Tony Schumacher and perennial World of Outlaws sprint car champ Steve Kinser, an All-American for a record 17th time. Other members of the 2004 team are Jimmie Johnson, Sebastien Bourdais, Ron Fellows, Max Papis, Scott Pruett, Bobby East, Martin Truex Jr., Bobby Hamilton, Bill Auberlen and Thaigo Medeiros. Kenny Bernstein, a seven-time AARWBA All-American, also will be honored as the winner of the Pioneer in Racing Award. Bernstein was the first driver to break the 300 mile per hour barrier, is the only driver to have won NHRA series titles in both Top Fuel and Funny Car and, as a car owner, was successful on both the NASCAR and CART circuits. Force, winner of a record 114 NHRA tour events including at least one in 18 straight seasons, is back on the team after a one-year absence during which he was supplanted by former teammate Tony Pedregon. Until Pedregon won the NHRA POWERade Championship in 2003, Force had been on a record 10 consecutive teams.